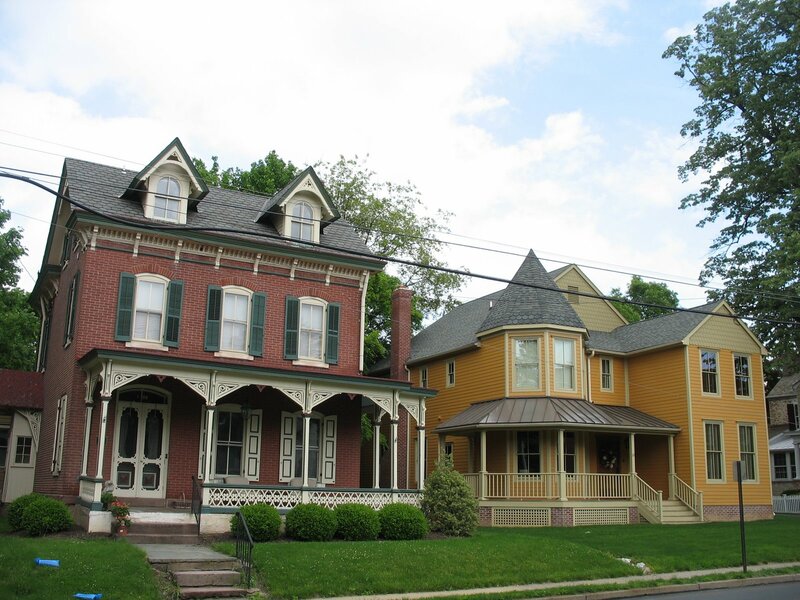 This is another old house we saw on Saturday in Doylestown, it looks pretty Mellow Yellow to me. For more Mellow Yellow Monday posts click here. 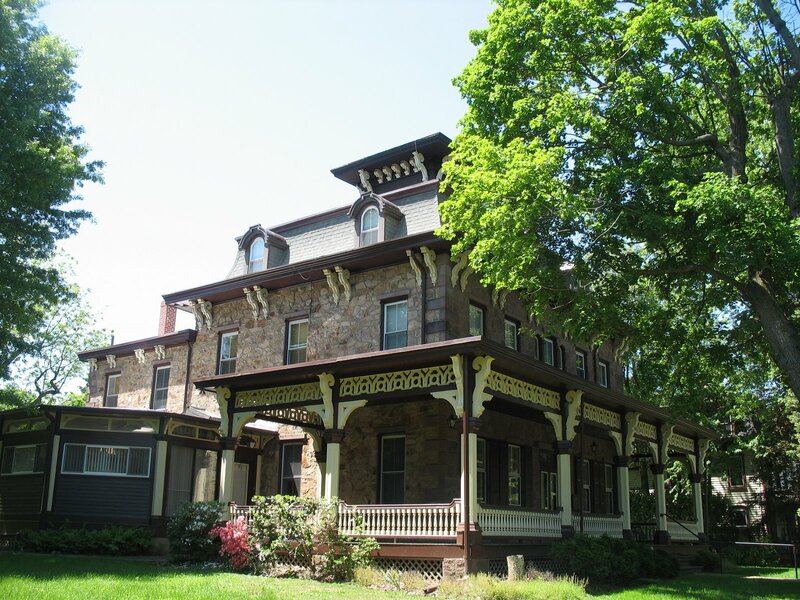 This Doylestown house is where the Buck's County Civil War Museum is located. It's on my very long list of things to do. 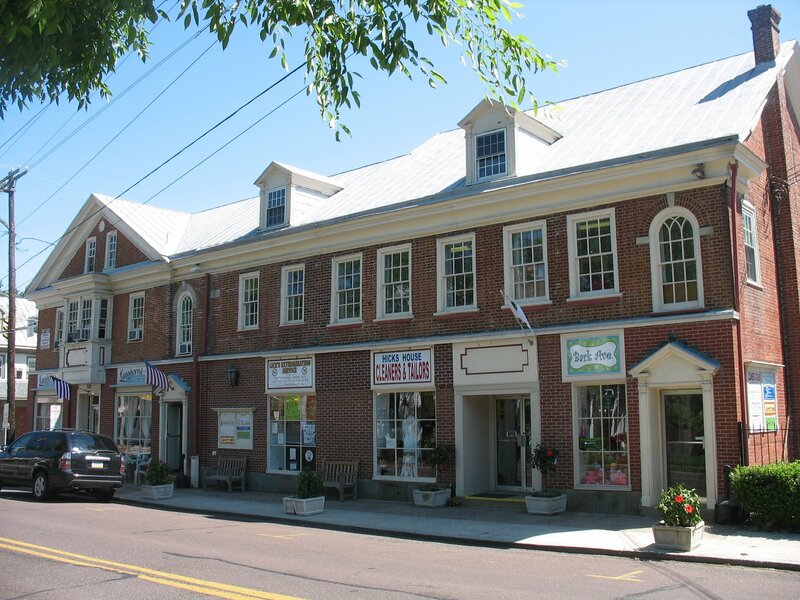 Doylestown is about 11 miles away from Newtown and from what I've seen has a bigger historic downtown and a really great variety of old homes in many styles.I found out that every last Saturday at the Newtown Farmer's Market the Amish merchants have a pig roast. Today we were able to get some of it but just the last scraps, next month I want to get there early. 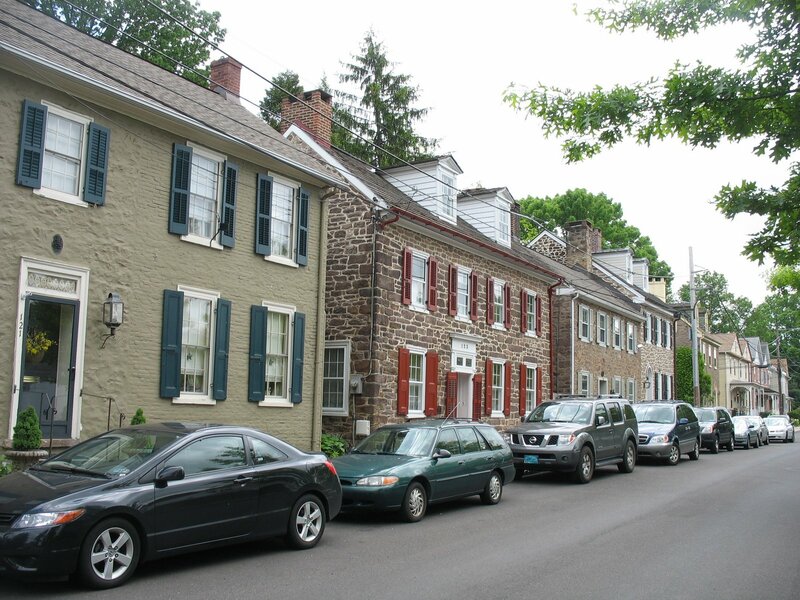 I love these 18th and century homes and buildings. I live about a mile away from Tyler State Park, and while hiking around I discovered this covered bridge. On the other side of the bridge next to the trees was a grassy area that was hidding three little deers. I had a truly watery Wednesday today. I took a walk in the woods while it was raining and saw a creek, a stream and a pond full of frogs. To enjoy all of the Watery Wednesday posts please click here. "Shadrack (the bird) and I want 50% of the money that you make on this picture." Today Vicki and I walked to the Newtown Memorial Day Parade. It was supposed to start at 9am so we got there at 9am and waited in the Starbucks right on the parade route. It turns out that the parade started several blocks away then stopped at the Council Chamber for speeches. So after waiting for an hour and talking to a few nice people, I walked over and caught the end of the last speech and the beginning of the parade. The parade itself didn't last long but it was very moving to see the old World War II vets and patriotism. I was in the Navy during the "cold war" and thankfully didn't see the horrors or lose any friends in battle. I remember seeing the sadness and loss in the face of my kindergarten teacher when she lost her son in Vietnam. I salute the fallen, the fighting and those who lost loved ones to war. I present this as my (new) world in Newtown. To see all the other my world tuesday posts just click here. This is the old 19th century church behind my house. It's one of many in Newtown. This one has a grave yard on the side. It's nice to hear the bells ringing. I'd like to take a look inside someday. My church's building is modern and not very close. Today Vicki and I both had banana pancakes at Pat's Colonial Kitchen (yum!). Then we got library cards and off to the farmer's market where we picked up lunch and dinner. After a very good BBQ pork sandwich and side of sweet potatoes, I took a long walk in Tyler State Park. It's really great being in the woods. There are so many birds it's like a wild symphony. I almost got lost a few times but managed to find my way out. Oh I also saw a woodpecker for the first time. Today was really hot but in the winter the park has cross country skiing, ice skating and sledding. Now we just finished the Farmer's market burritos and it's time to walk to the downtown area. -After breakfast I saw this old tired dog and had to take his picture, he remind me of a sea lion. Today I took a long walk, and along the way I saw this beautiful tree, plus lots more interesting things that I'll share in the future. Vicki and I will have breakfast at a local spot that is supposed to be pretty good. I forgot to mention that our new church is a lot bigger than Calvary Chapel in Grapevine and there was a very good guest pastor (Pancho Juarez) and great music. I look forward to hearing the regualr pastor. I wish everyone a great weekend! 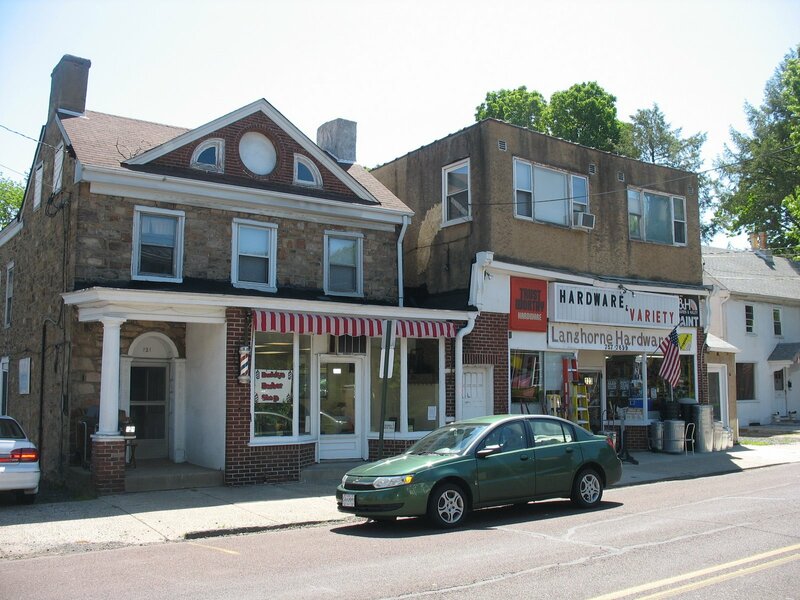 Today I went to the historic section of Langhorne which is just a few miles from Newtown. It's nice quiet place with friendly people. 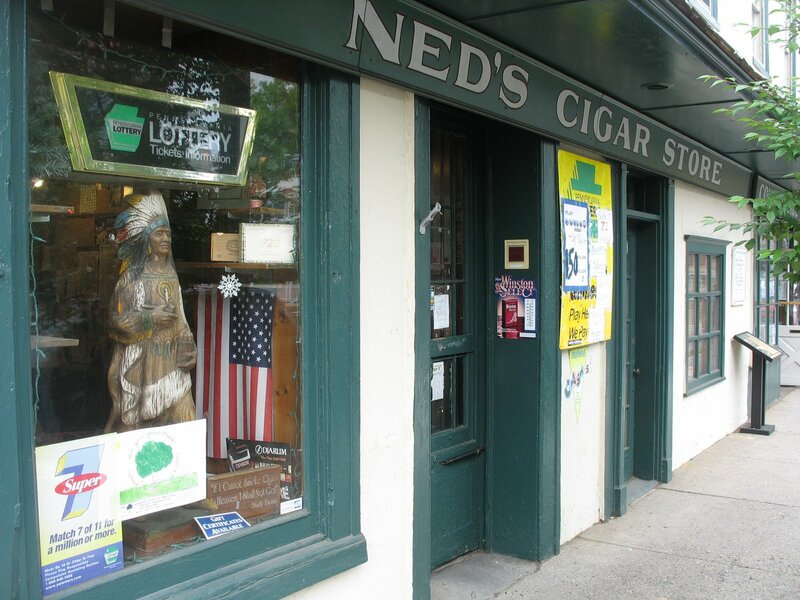 After I parked my car and started walking I saw an older guy wearing a barber's smock standing in front of an old barber shop that had a spinning barber pole. He nodded and said hello, I walked around and took a few pictures then came back to get a haircut. The Barber shop is called Buddy's Barber shop and the guy that said hello was Buddy a really nice guy. Buddy had a customer but his apprentice(whose name I can't remember) cut my hair. During the the haircut they both welcomed me to the area and gave suggestions for things to do. Buddy invited me to watch the annual memorial day parade from his shop. 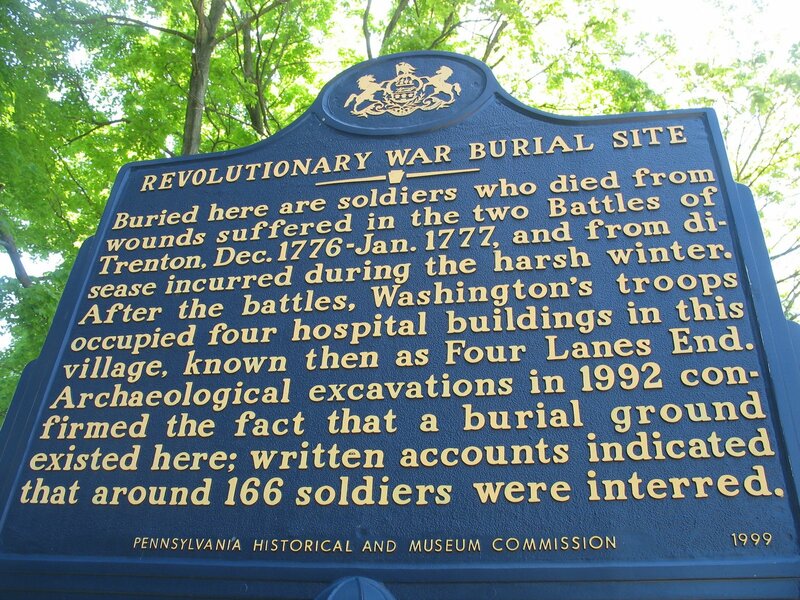 Later I met another couple who were hanging potted flowers along the street and they gave me directions to a revolutionary war burial ground and told me that the local coffee shop was a makeshift hospital during the revolution. I went to New York today. 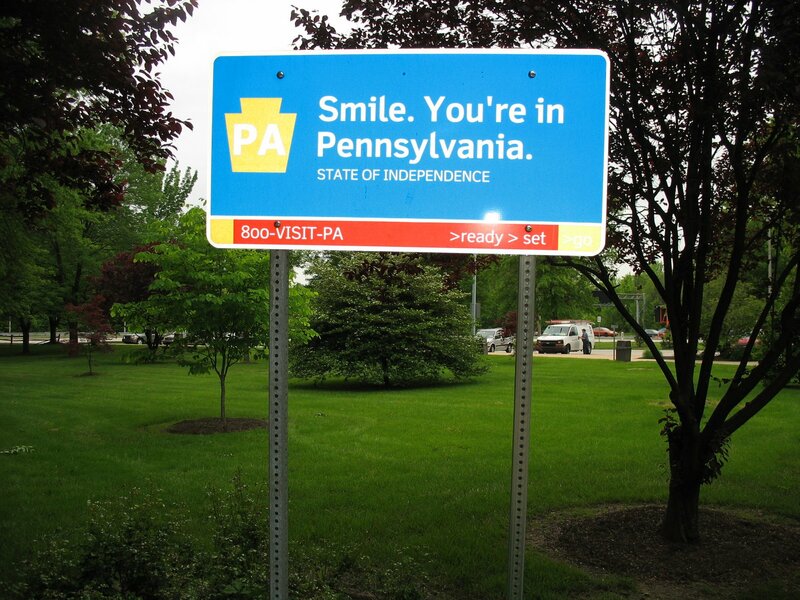 It was a ten minute drive to Trenton New Jersey then an hour and fifteen minute train ride to Penn station in NYC. 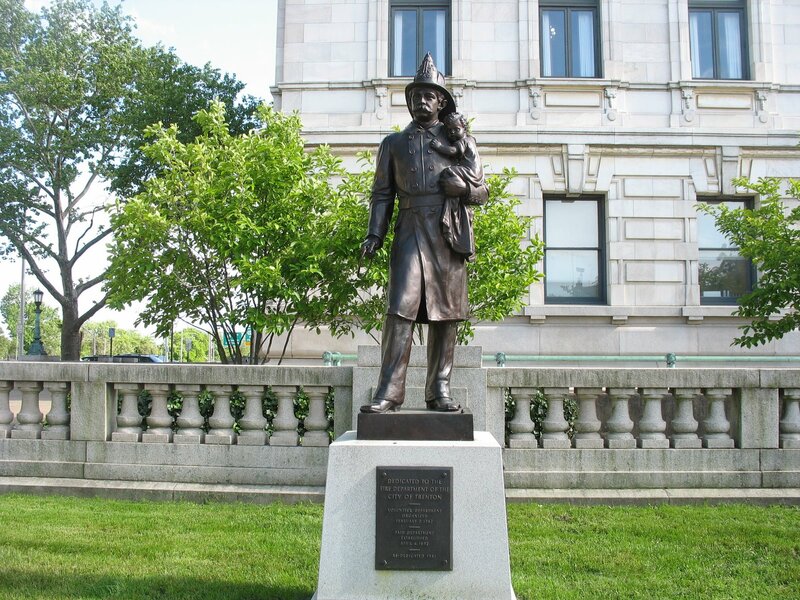 When I got back to Trenton I took this picture in front of a Municipal building near the train station. 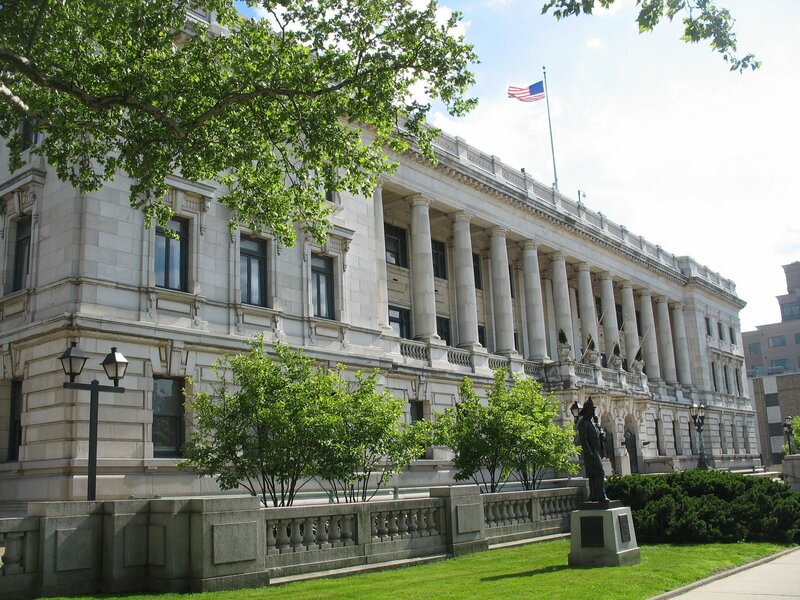 Some guy on a bike was making a big deal about me taking pictures of a federal building and how it's against the law. Sounds like an urban legend to me, but if the Feds knock me to the ground and take my camera.....well I guess he would be right. Tomorrow we pick up the keys to our apartment and Wednesday morning we move in. Yippee! I'll post some New York pictures on the Something Sighted blog. Newtown has hundreds of these beautiful old houses, I wonder how long it will take for me to find my favorite one. They're fun to look at but I bet they are a lot of work to keep up. I have a free day tomorrow, and the weather is supposed to be nice. Maybe I'll take the train to NYC. I've heard from several people that summers here are brutally humid. 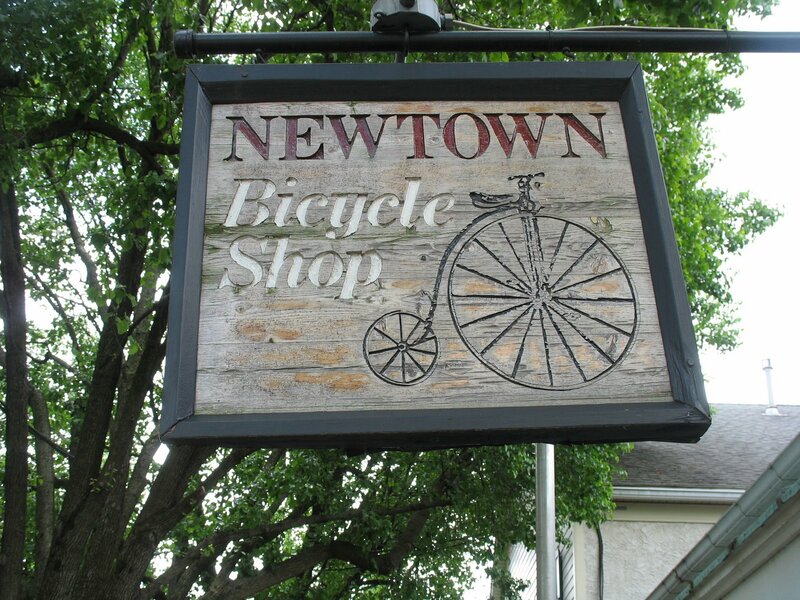 I've spent summers in Mississippi, Texas and even the Philippines, so how bad can Newtown be? Today my wife and I drove to our new neighborhood for lunch and a walk. It's very different than what we're used to. 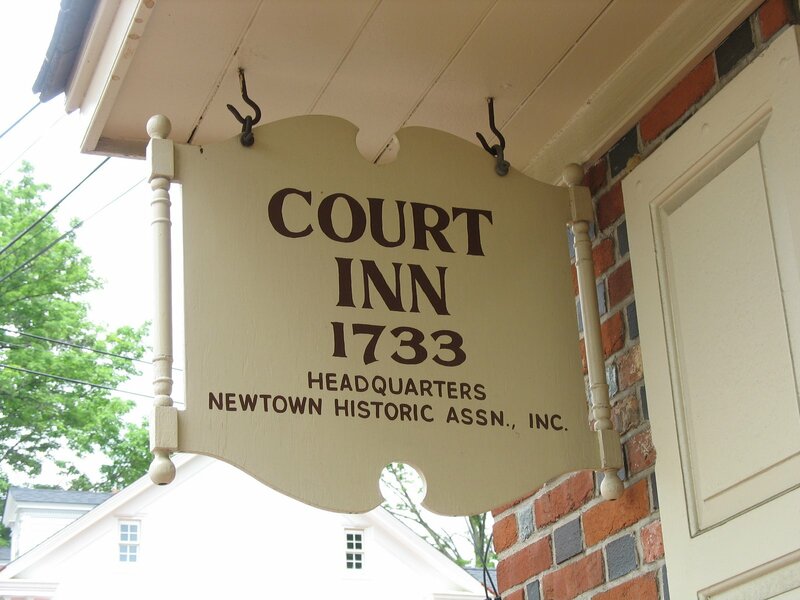 Newtown was established in 1684 and has less than 3,000 people. The buildings, shops and houses are very quaint and there are plenty of mature trees. Then we took a short drive to an indoor farmer's market where we had ice cream that was made by Amish people. Yum! So far we love it here. Tomorrow we go to our new church. I finally made it, but my wife and cat's flight was canceled do to bad weather. So I able to spend a few unexpected hours walking around Baltimore. From there it was only supposed to take two hours to drive to Langhorne Pa, but the Philadelphia Phillies had a day game so it took four hours. I hope the Dallas weather is better tomorrow. Now we wait for the movers while we get to know our new area.